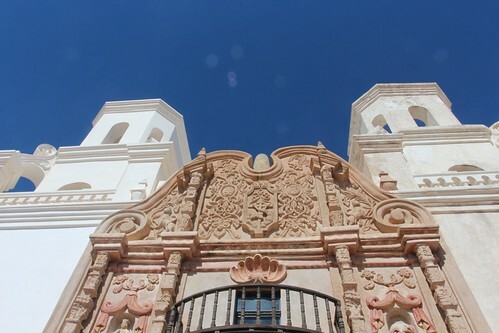 Mali Mish - Day 199: Hotel Congress, Mission San Xavier del Bac and more Airstream friends. Today we spent most of our day roaming around the town. 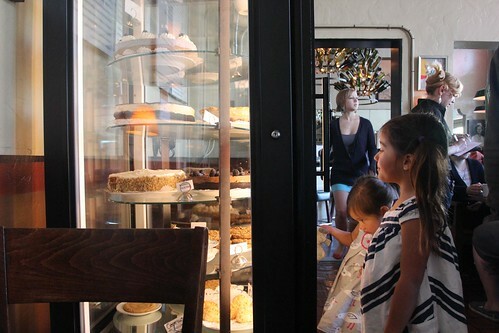 The Cup Cafe at Hotel Congress was our choice to stop for breakfast. We have been here many times and have never been disappointed. 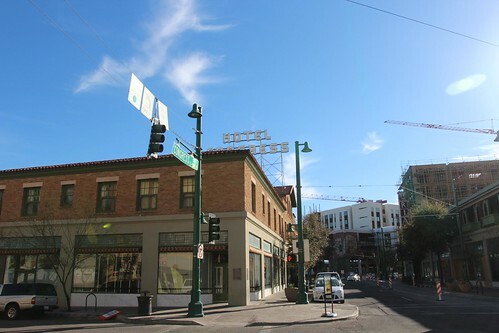 Hotel Congress first came on the scene in 1919 when a club called The Tap Room first opened. Less than a year later, Prohibition became the law of the land. 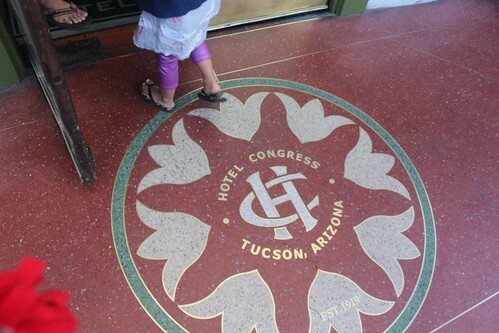 Hotel Congress is also famous for its fire in 1934 while John Dillinger happened to be staying here and was captured. The Cup Cafe is relatively new to the building. It did not open for business until 1990. 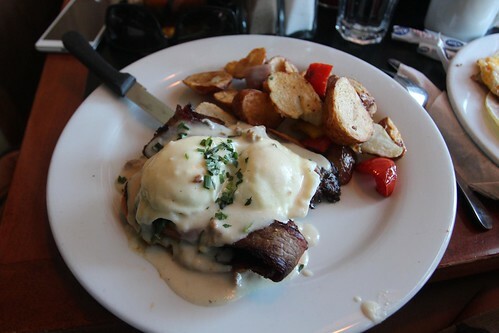 But the food is pretty phenomenal. This is called ‘Braveheart’. It is smoked brisket on sourdough toast with melted Gruyere cheese. Marlene still can’t eat any dairy since Luka is still allergic so she opted for her usual: Oatmeal with no milk. And no dessert for her either. At least I won’t be tempting her with my lack of a sweet tooth. 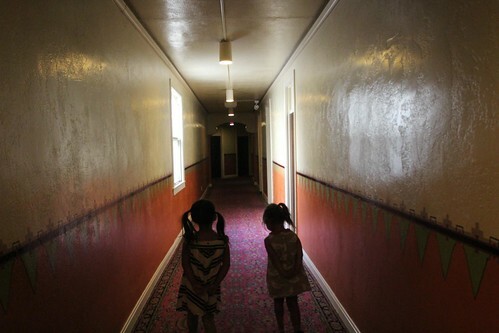 Every time we come here, we always help ourselves to a little walk through the hallways. We have heard that there are ghosts hanging around here from the people who perished during the fire but have never encountered any. Ava and Mila have both outgrown their ‘gifts’ so we will have to depend on Luka in a year or so to help us with our ghostbusting. 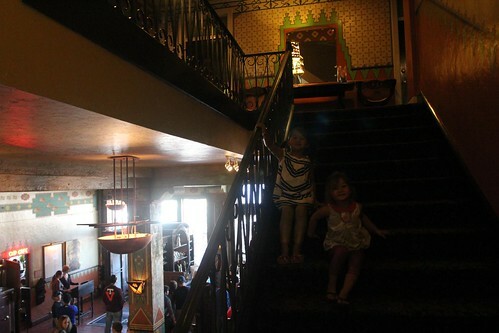 I hope Hotel Congress doesn’t get mad at us because there are signs clearly stating that only hotel guests are allowed upstairs. 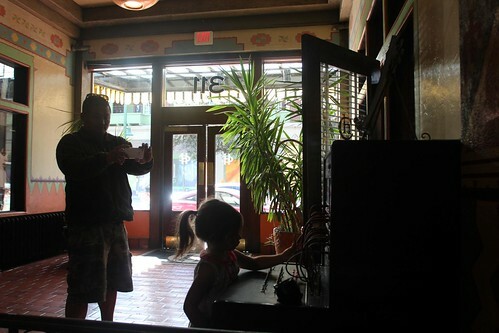 Mila will gladly work off any incurred expenses by working as a telephone board operator. 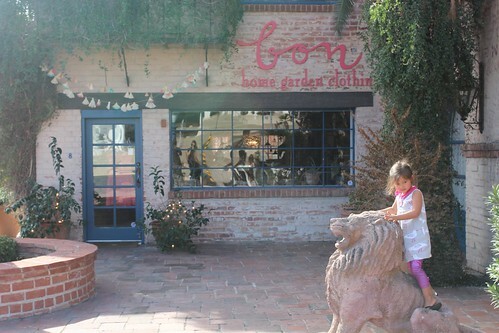 Another one of Carrie’s suggestions during our visit this time was to see this little home decor boutique that her friend owns. She knows Marlene real well and thought that this is right up her alley so we decided to come check it out. Her friend wasn’t working but her mom was. I don’t think she liked that kids were in there too much. She made a real effort to straighten out anything the girls touched even if it didn’t really move. 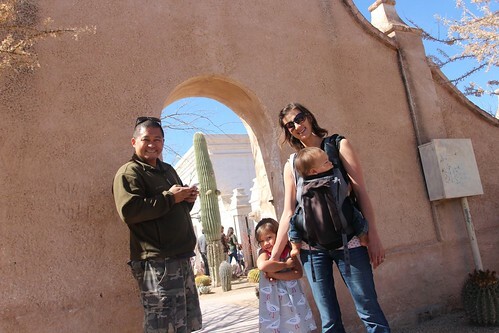 Another great place to see is the Spanish mission here in Tucson. When we came here last time, the facade was under repair so it didn’t make for a very good photo opp with all of the scaffolding. I think they purposely left the right tower original as a comparison to the refurbished one on the left. 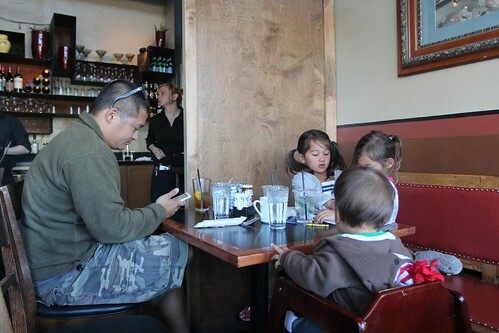 We even let Ava take the SLR camera for a view from her perspective. As Ava is getting older, she now has a lot more stamina for climbing and hiking. Mila is still too small and gets tired quickly so Ava and I climbed to the top of the stone mountain to see the cross and to get a view of the mission below. 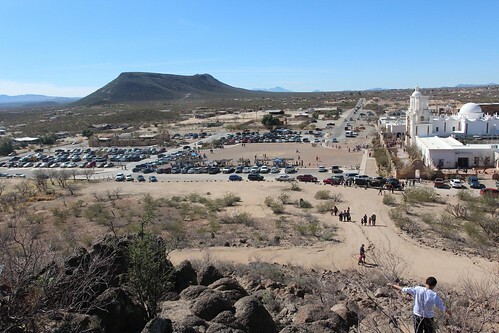 Since today is a Sunday the mission was packed full of both visitors as well as people attending Mass. 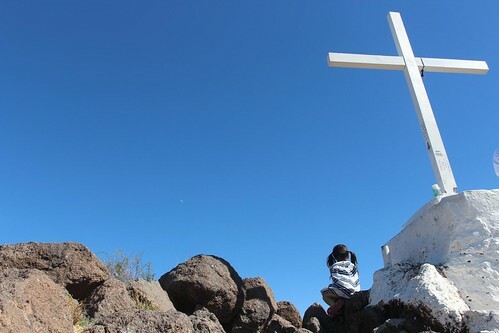 As we left the San Xavier del Bac mission, we headed back into town with plans to meet up with another friend in town. 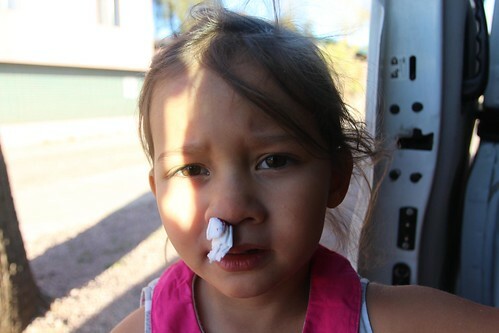 Just as we parked, Mila’s nose started gushing blood. It has been happening a lot since we got back into the warm and dry desert climate. Maybe we need to turn around and head back to Florida. Our last visit of the day is with the Luhr family. 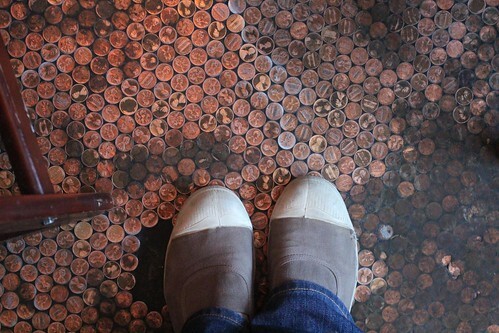 That’s Rich, Eleanor and Emma. They have just wrapped up Alumafiesta so we didn’t want to oblige them to a visit at their home while we are here. 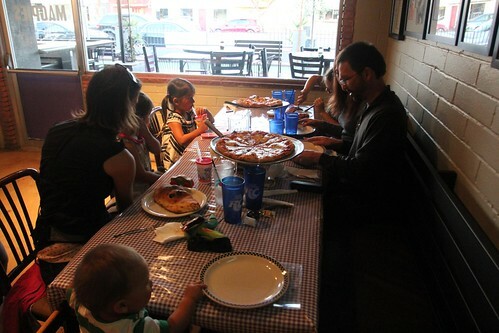 Instead, we met at the Magpie’s Gourmet Pizza near the U of A campus. 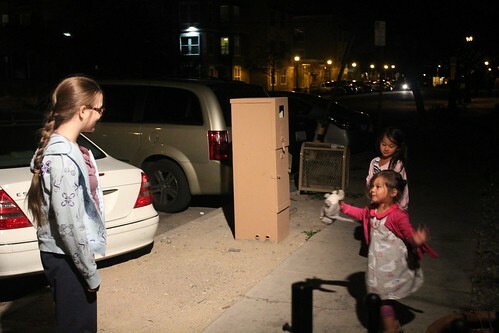 When we first met the Luhrs, we had just bought our Airstream and Emma was only 6 years old. Now our family has nearly doubled in size as has Emma both in age and size. One thing that hasn’t changed for both of our families is we are still loving our Airstreaming lifestyle. Tomorrow there is suppose to be some weather coming in the area so we will head out of Tucson and into the Phoenix area. 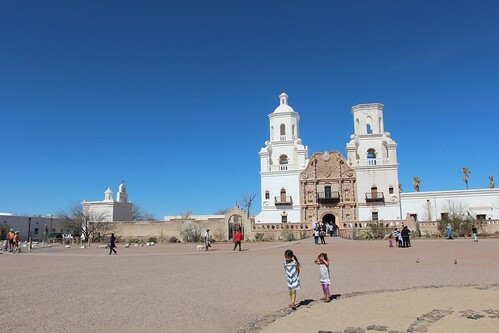 2 Responses to Day 199: Hotel Congress, Mission San Xavier del Bac and more Airstream friends. Great seeing you guys as always! We’re looking forward to seeing you on the road again sometime, and hopefully we will have more time to hang out! I’m sure you’ve tried stuff and talked to lots of people about the nose bleeds, but I think a common remedy is to coat the nasal membranes with something like vaseline to keep them moist. That should help the problem if it’s just due to dry climate.